I confess. 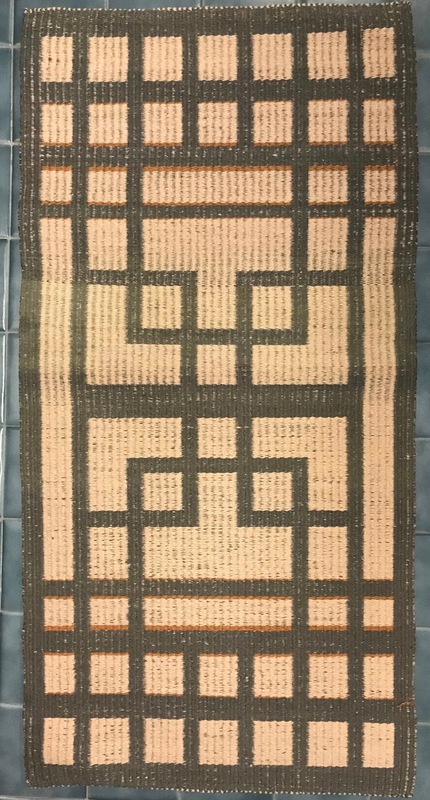 I abused a rug. It went like this. I put a linen warp on my Harrisville rug loom, wove about two-thirds of the planned length, then stopped. I didn't mean to stop. Life got in the way. Specifically, a full time job. When I got home at night, I really had little creativity and little to no energy. The partially woven rug sat on the loom. It sat a long time. Years. When personal time opened up and I had cleared the clutter and reclaimed my work space, I uncovered the rug. I wrote it off. It had sat too long. I would cut it off and start a new one. But when I sat down, scissors in hand, to cut off the rug, I found that the warp was as good as when it was put on. What? How could that be? Now if you've ever woven with a linen warp, you know that linen is not very friendly. Try as I might, every linen warp I have ever put on had some slush. It seems inevitable despite dozens of warping sticks. And when the tension is even a little bit off, the warp shows it. Except with this loom. My loom is a Harrisville rug loom with shaft-switching device is a fantastic loom, but in this case the winner for utility goes to the warp extender. Functioning as a second beam, the warp extender overcomes the tension problem because once the warp is threaded and tied on in the front, there is no need to unwind the warp from the back beam. A vertical solution to weaving on a warp that is stationary, that is, not wound on a back beam or equivalent, the warp extender can be raised nearly to the top of the loom, allowing the weaver to put up to seven feet of warp under tension and not worry about changing tension with the advancing warp. Does the innovation belong to Peter Collingswood? Maybe. An early 1990's technical preview of the Harrisville Rug Loom notes as a special feature, "The new TENSION EQUALIZER is an innovative mechanism that Peter Collingswood incorporated into his own looms." Instead of unwinding the back beam, the weaver advances the warp on the warp extender by lowering it. Couldn't be easier. And now I can report that the warp extender saved a rug. 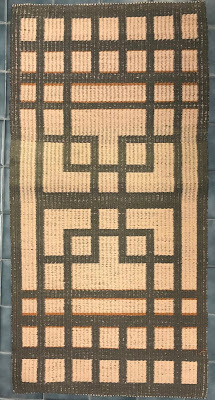 I wove that rug to the end and finished it with a Taniko edge. What do you think? I wasn't very excited about the focus for the upcoming workshop and sample exchange, so I hadn't signed up. But I changed my mind--and am so glad I did. 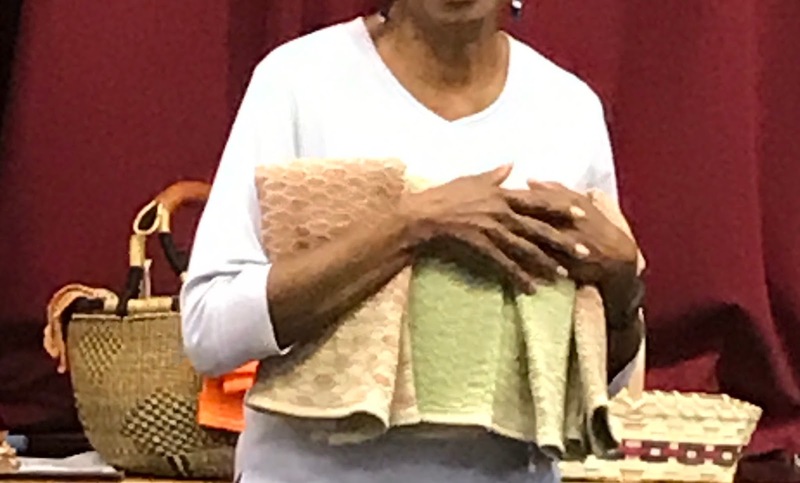 The backstory: To complement its March 2018 program, Hands-On Workshop: “Plain Weave Isn't Plain Anymore,” the New York Guild of Handweavers set up a sample exchange. Again, plain weave, aka tabby, which can be woven on any type of loom, including a rigid heddle. If you've never participated in a sample exchange, it works like this. 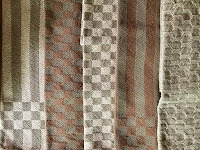 Sometimes there is a theme--in this case, it's plain/tabby weave--but not always. Each participant weaves and prepares a sample and documentation of relevant details--fiber, sett, finish, etc.--for as many people as are in the group. 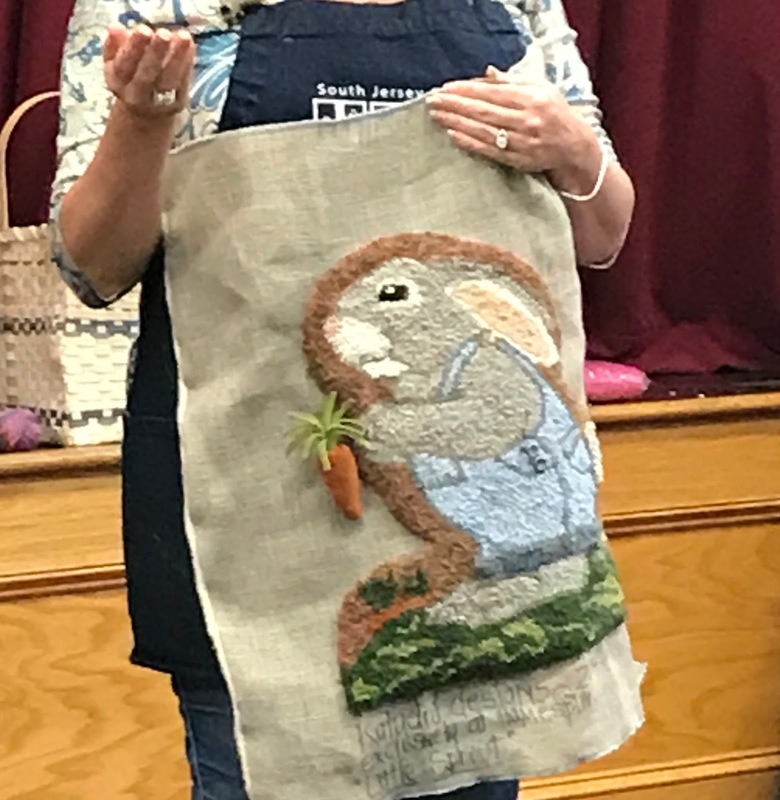 At the exchange, weavers share samples and experiences . These exchanges are an excellent learning tool and provide resources for years to come and I like to participate whenever I can. In this case, I wasn't the only one slow to the gate. At the meeting time, only a few had committed to the project. I admit that a guilt feeling figured in my change of mind, but the more I thought about it, the more I realized it would be a good exercise. I'd been wanting to do some exploration in structures such as collapse weave, which uses various types and sizes of fibers to achieve variation in texture. 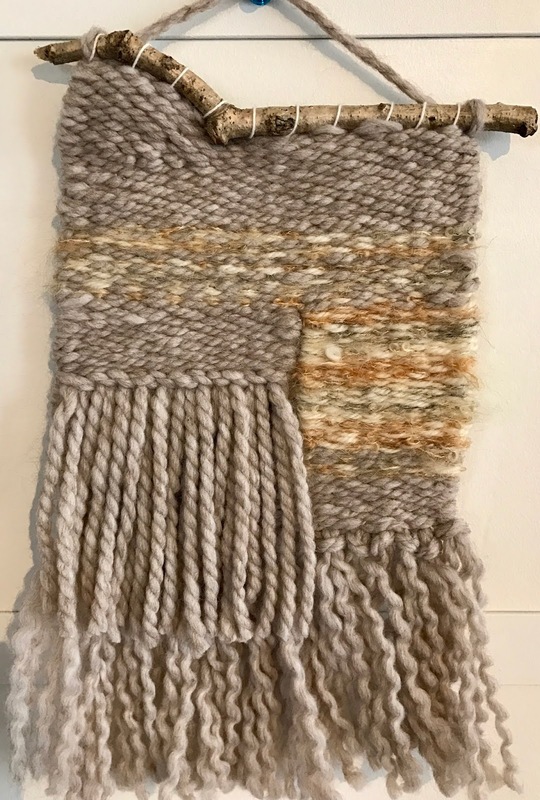 I'd also been thinking about incorporating my handspun into weaving, so that was a 'maybe.' And I imposed one more rule on myself: I had to do it from stash. My mind went into overdrive. 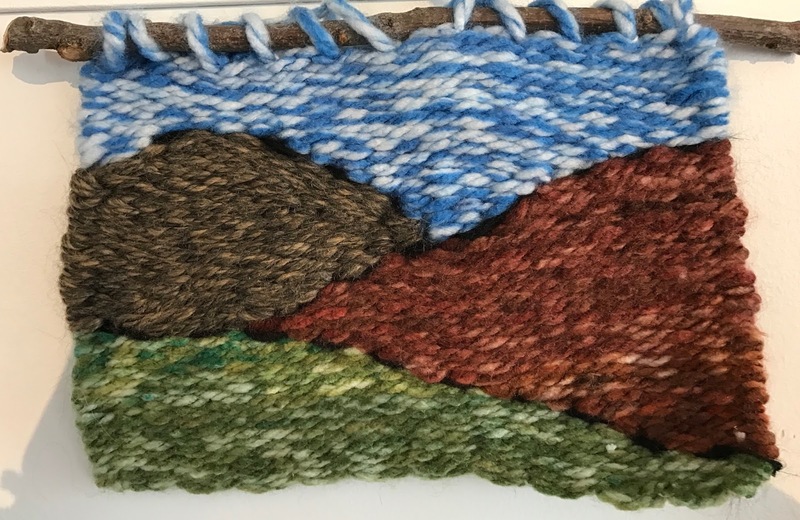 For this exercise, I decided to build the color warp around a two-ply Coopworth handspun yarn hand-dyed a dark red with brown tones and color variation. The yarn wouldn't win any prizes in a skein competition, but the variation and slight differences are interesting. 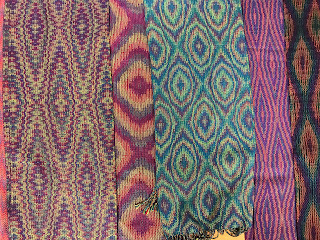 First I tried the lavender rayon with the handspun, as at the left of the wrapping. Yuk. By the time my wrapping reached the right side of the cardboard strip, I liked where I was headed . 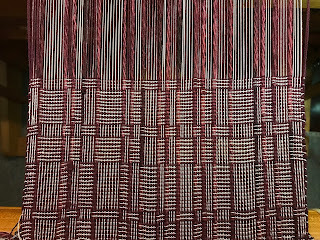 So I warped up my loom with the three very different threads. Different weights. Different textures. Different twists. Different spacings. And I started weaving with two shuttles, one carrying the cranberry yarn and the other, the gray rayon thread. I was delighted with the outcome after just a few inches of weft. It was such fun playing with thread watching the changing effects. What better fun can there be? I focused a great deal on the MidAtlantic Fiber Association (MAFA) biennial conference before the event, but dropped the ball in following up. That had nothing to do with the event and everything to do with me. Lots of catching up--and lots to prepare for the fall shows. First, the MAFA conference was outstanding from opening evening with Madelyn Van Der Hoogt's keynote to the very last lunch. Yes, the hot weather created some challenges, but I remember the days of no air conditioning. It was nothing humans haven't been coping with for eons. Second, my workshop was excellent. 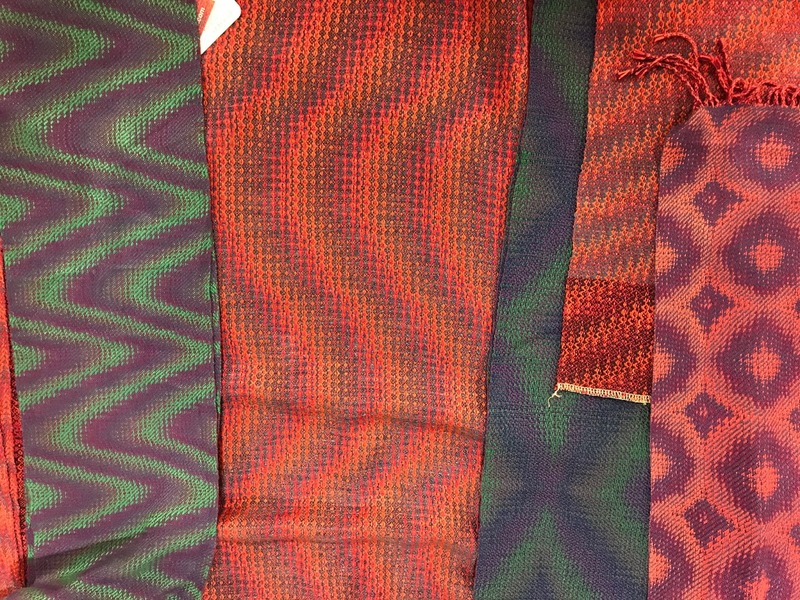 During the time I was away from weaving, network drafting, echo twills, and taqueté techniques entered the weaving vocabulary. 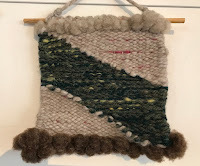 I had read the seminal book on the subject, Alice Schlein's Network Drafting: An Introduction, as well as Marian Stubenitsky's Weaving with Echo and Iris, but wanted more insight and some hand's on experience. 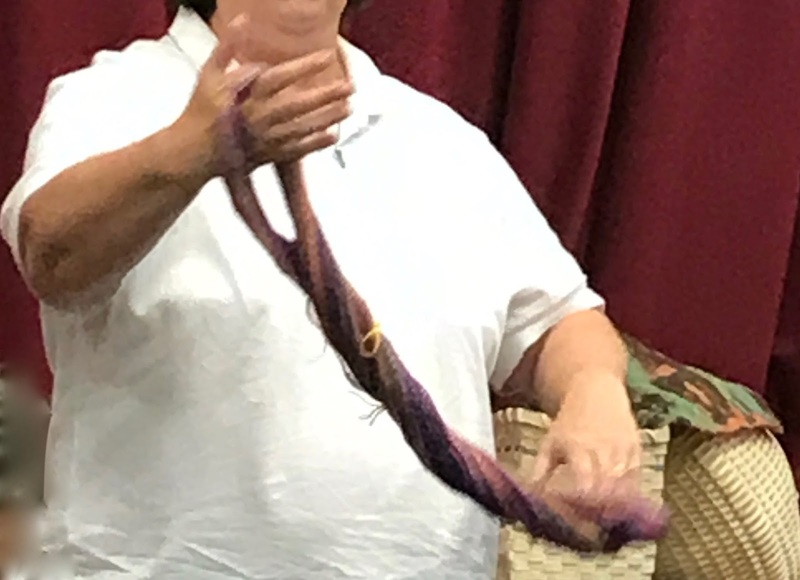 Linda Hartshorn's workshop, Weaving in a Parallel Universe, delivered both. The workshop was a round robin, which means that each participant weaves on each of the prepared looms. Each person brings a loom with a different warp and threading (and tie-up with a floor loom) that have been assigned by the instructor. In the class, everyone takes a turn weaving on each loom and labels his or her section. (The labels are visible in the photo of student samples below.) At the end of the workshop, the samples are cut apart and each weaver leaves with a sample of each the weaves. Although some techniques are possible with on 4-shaft, eight-shafts is really the jumping off point for exploration. This workshop was for 8- or more shafts. My table loom has 8-shafts, as did most of the looms in the workshop. I came home with a nice sample book--and with plans to weave some of them. Some really aren't practical for me. Even though I have a 12-shaft loom, patterns with very long treadling patterns would be all but impossible with my limited number of dobby bars on a strictly mechanical dobby loom. 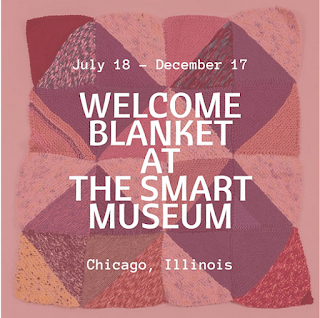 The Welcome Blanket exhibit is open at the Smart Museum of Art in Chicago. The crowd-sourced installation, which is by Pussyhat co-founder Jayna Zweiman, focuses on political activism to confront immigration and refugee resettlement issues. Anyone can be part of the exhibit. I did. And I'm so pleased to be part of the project. All that's required is to send a handmade blanket to the museum, along with a note to an immigrant or refugee. 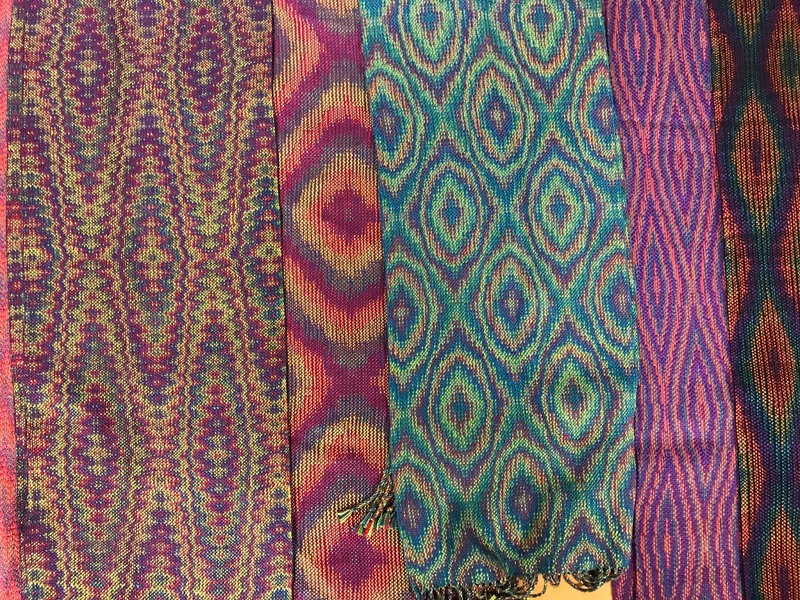 Although the first call emphasized knit blankets, the blankets only need to be handmade They can be knit, crochet, quilted, woven, whatever. The exhibit is fluid and ever-growing. The Hyde Park Herald has posted some photos of incoming blankets here. According to the museum's website, the exhibit opens in an empty gallery, which will serve as a receiving station to sort, document and store donated blankets. 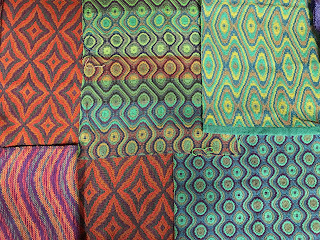 Over the exhibit run, blankets will accumulate in the gallery transforming the space from a sparse, empty space into a visually exciting installation of the handmade blankets. Visitors to the museum are invited to spend time knitting in the gallery, as well as to attend a series of public programs focused on human rights, immigration and artistic activism. When the installation closes in December, the blankets will be distributed through community partners including immigration organizations and refugee resettlement agencies. It's not too late to submit a blanket. The mail-in deadline is September 5. Directions to participate, as well as patterns and mailing instructions are here. And if you're near Chicago, please visit. Take some pictures and share them. Admission is free! Labels: exhibit, knitting, Smart Museum. The MidAtlantic Fiber Conference's (MAFA) biennial weekend workshop is days away and my mind is full of plans and preparations. In large part, that's because I'm one of the volunteers working to make this a memorable event. MAFA is an all-volunteer not-for-profit organization and dozens of people on its Conference Team has been working for two years to make this regional event the best ever. Yes, planning started when the last conference ended. I know there will be unexpected complications, but it won't be for lack of effort. 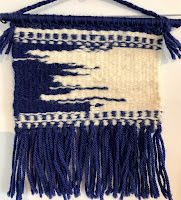 I'm also preparing for my workshop, Weaving in a Parallel Universe, with Linda Hartshorn. I expected amplified craziness preceding the event, so I warped my loom last month. And then I prepped my loom for travel. I have a vintage 8-harness Schacht table loom with a 24 x 26" footprint. We all know that most table looms--especially the vintage variety--are portable, but portability is not their strong suit. Here's how I have made my table loom ready for transport. My husband outfitted my table loom for transport by attaching a handle on one side of the castle. That helps with picking it up, but when it's warped and ready for weaving, there are other concerns. For transporting a warped loom like mine, I see three primary points that need protection: The reed, the warp, and the beater. To secure the reed in the middle of the beater and protect the warp, I use a strip of soft knit fabric. I fold the fabric in half around one side of the beater and twist the fabric several times on each side of the reed before securing it on the other side. I often use such strips of knit fabric for headers, any fabric, rope or even a bungee would work. I use the soft knit fabric to keep the warp from moving on the back beam--and on the front beam if there is nothing woven to stabilize it. I made a cover for my loom, but the underside is still open. I will stuff some soft plastic dry cleaner bags around the vulnerable beams. No cover? I'd use a blanket or a soft plastic sheet over the front and back beams to protect the warp during travel. I'll also bring my stand, which my husband also made, and a stool that puts me at the right working height. And I'll bring a utility cart to move it from my car to the workshop location. And there it will stay until it's time to go home. July 4th, roots, and refugees. Unless you are an American Indian, you, like me, are the daughter or son of immigrants. My family's immigration story is lost to time. No stories exist of their struggles and difficulties. But I have no doubt that they were real. I have no delusions that I am related to royalty or some rich and famous person and, frankly, I find most claims silly. I cannot believe that my ancestors came for the joy of it any more than I can imagine that I am a descendant of Lord So-and-So of Castle Wherever. My ancestors most likely came to this country for opportunity, as many people still do. But currently too many people aren't leaving their homes because they want to. They're leaving their homelands and families to escape tyranny, hunger and war. Which brings me to the current refugee crises. I don't know the answer to war, hunger, and despotic lunatics, but I can help support what is surely a difficult transition. One way is through the Welcome Blanket Project. 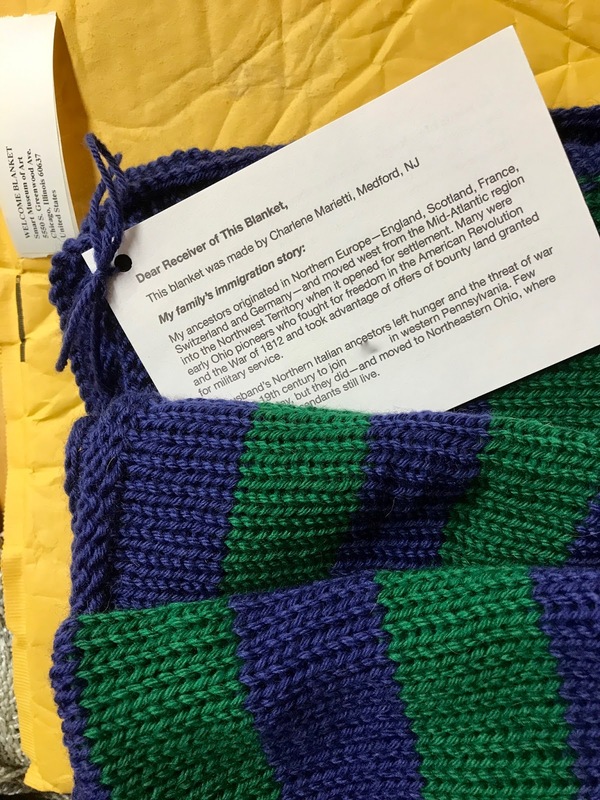 "The Welcome Blanket Project aims to connect people already living in the United States residents with our country’s new immigrants through stories and handmade blankets, providing both symbolic and literal comfort and warmth. At the same time, the project offers a positive, hands-on way to understand the scope of a 2000-mile border wall and to subvert it from an idea of exclusion to one of inclusion. By participating in this project, people will also come together to talk about immigration policy and how it affects real-live people." Project leaders wondered whether, instead of thinking about a wall to keep people out, "what if lines of yarn became 3,500,640 yards of blankets to welcome people in?" They have invited knitters to make a 40" x 40" blanket. By their estimation, a blanket that size would take about 1200 yards, thus requiring about 3,200 blankets to stretch over 2,000 miles. The project provides patterns, a tutorial, and sample 'welcome notes' online. The project is keeping track of yardage, too. In addition to sending a blanket, knitters send a tag with care instructions and yardage used in the blanket. Contributors are also asked to enclose a note that welcomes a refugee, shares their family's immigration story, and offers words of welcome and advice about living in the United States. My ancestors originated in Northern Europe—England, Scotland, France, Switzerland and Germany—and moved west from the Mid-Atlantic region into the Northwest Territory when it opened for settlement. Many were early Ohio pioneers who fought for freedom in the American Revolution and the War of 1812 and took advantage of offers of bounty land granted for military service. My husband’s Northern Italian ancestors left hunger and the threat of war in the late 19th century to join paesani in western Pennsylvania. Few intended to stay, but they did. They quickly moved to Northeastern Ohio, where most of their descendants still live. 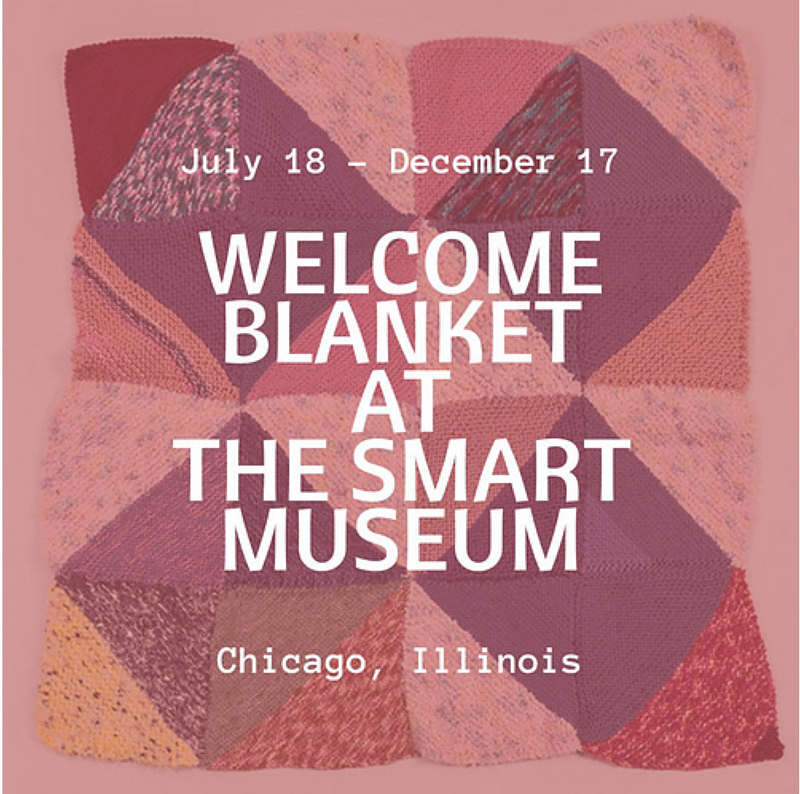 The knit blankets will be displayed in an inaugural show at the Smart Museum of Art at the University of Chicago beginning July 18 and running through December 17. After the show closes, the blankets will be distributed to refugees and other immigrants though resettlement organizations. My contribution goes in the mail today. If you have ever spun or woven in public, you know that there is little to no understanding of either craft among the general public. Not unlike the lack of connection between farm production and supermarket displays, the public in general has little to no concept of fabric construction. Industrialization separates us from understanding some of the essential building blocks of humankind. I recently spent a day weaving at Walnford Day at Monmouth County Park System's Historic Walnford House in Upper Freehold, N.J. That's somewhat of a misnomer as I spent most of the time talking about historical precedent, how and why weaving was important to colonials, and helping the public, many of them children, weave a few shots. It was a really good day and I loved it. 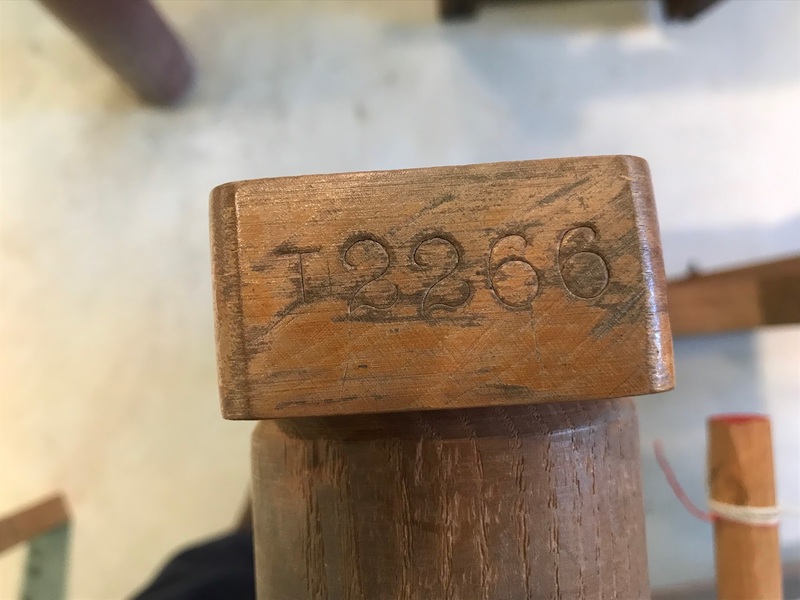 There is no evidence that the owners of the Walnford property owned looms or wove themselves, they operated a fulling mill along with a grist mill and lumber mill, so it is safe to say that there were plenty of weavers in the area. Historic Walnford has three operating looms that have been gifted to the property, none of which is period. The vintage Sears Fairloom, which was made and sold by Newcomb Loom Company as its Studio Art loom, is warped to weave rag rugs and used for education and sampling by the public. Although the Newcomb Loom Company, which was established in Davenport, Iowa in 1889, ceased operations in the 1980's, Newcomb looms are still being used by weavers. If you have one, you can add it to the registry hosted by Weaver's Delight for a very modest fee, find parts and order a copy of the original instruction manual. For Walnford Day, it was a time to introduce people to the frugality of former times. I took along strips of cotton fabric for the rag rugs and they served as a great conversation starter. 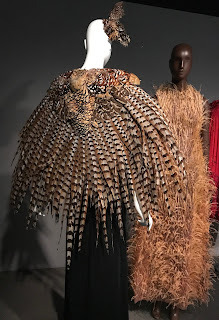 As I talked about colonialists' frugality and how they repurposed as much as possible, I asked what they thought the fabric was from. (It was from an old bed sheet.) Surprising even to me was how many people didn't even know where to start. Dressing in period costume was not required for the day. I don't have costume, so obviously, I didn't. But some presenters did. The spinner, for example, had a lovely outfit complete with a charming little hat set sideways just so. And it got me thinking about period costumes for history days like this. Here is my problem: Spinners and weavers don't dress in lovely outfits to perform their work now--and they never did. They need to move. They're engaging in physical labor. Weavers, even more than spinners, need to throw shuttles (long sleeves would interfere) and to crawl under the loom (unless they're production and have a loom boy, i.e., child labor). These are not jobs for ladies sitting in parlors with an embroidery hoop. The dressing up in Sunday bests for the middle and upper-classes is colorful and fun, but it does not convey the hard lives that most people lived. If I were dressing to weave or spin in a historical context, I'd wear a coarse cotton or cotton and linen shift-style dress in a natural color. If a head covering were needed, it would be a simple scarf. 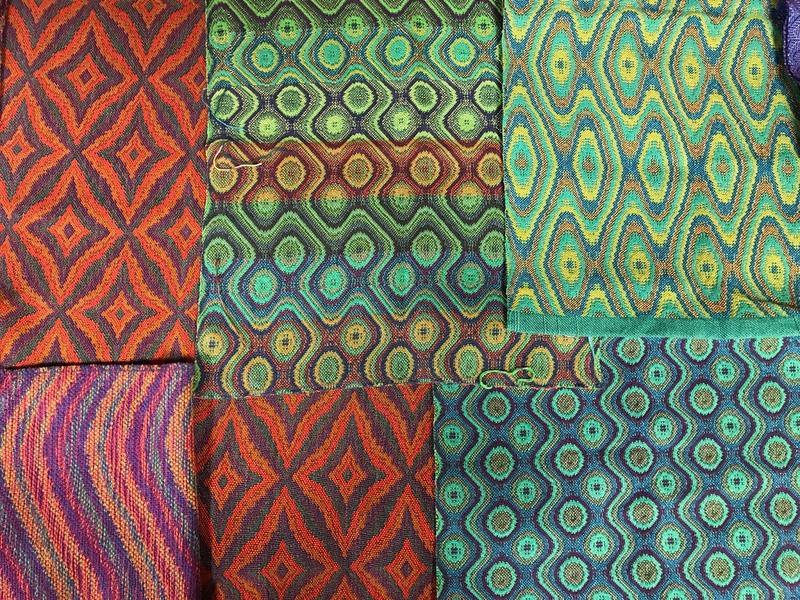 When fiber artists share their work, it's a bonanza for everyone. Over the past year, the weavers' study group in the South Jersey Guild of Spinners and Handweavers wove towels as a project. The object, I learned too late, was to use a draft such as huck or M's and O's. As I see it, there are two major upsides to show-and-tells. The most valuable is sharing knowledge and experience when fiber artists discuss not only what they made, but they made it. It's the time to talk about the surprises and the disappointments that inevitably accompany the creative process. 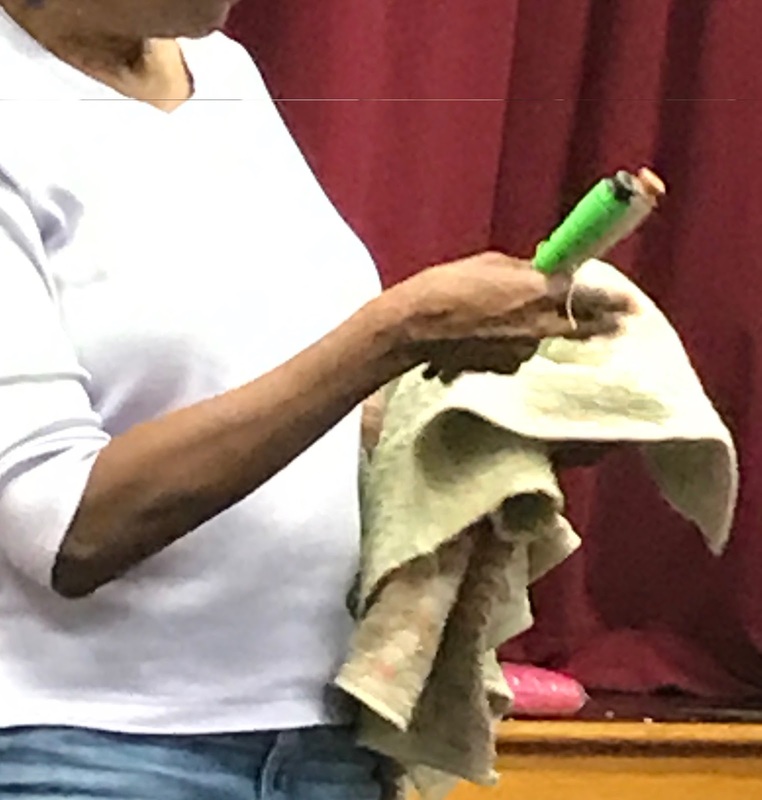 At this sharing session, one weaver discussed the diluted color effect in her towels. 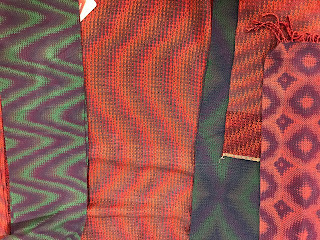 On the bobbin, the reds and greens were bright, but when surrounded by neutral colors in the double-faced honeycomb weave, they are significantly subdued. My project work is visible in the two stacks of towels to the left of the large basket in the center of the photo. I shared my project work earlier this year in my "Tea Towels" blog, but after weaving six towels, I had cotton left over. So I warped it on and wove more towels. 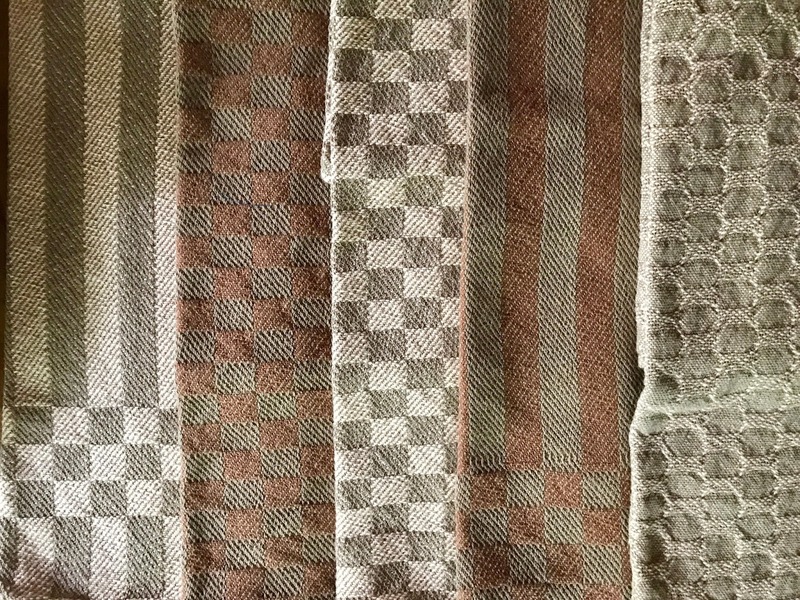 I not only had fun weaving five more multi-harness twill weave towels (closeup: above, right) them, I was getting better acquainted with my new-to-me vintage loom and working out its strengths and weaknesses. 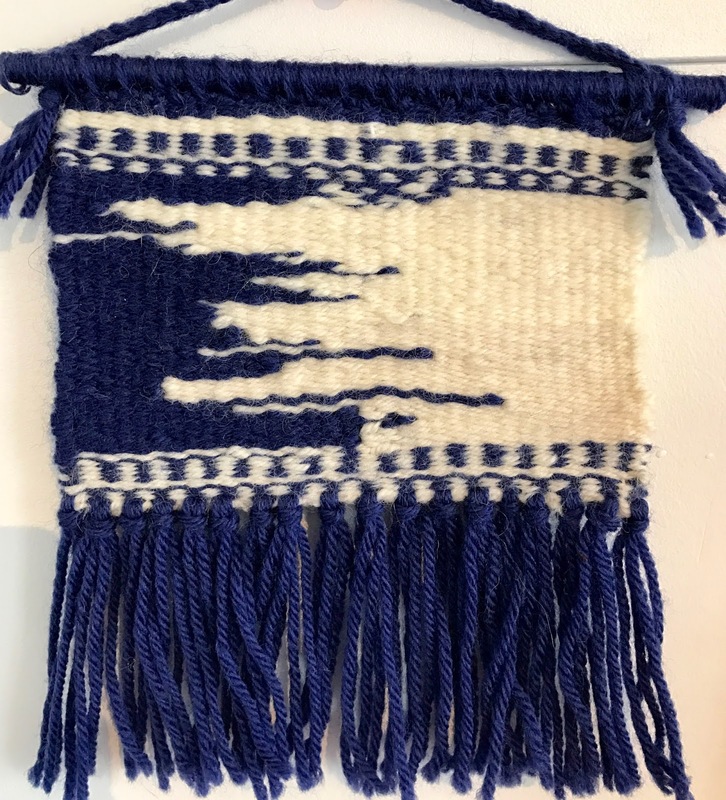 As the name of the guild implies, not everyone is a weaver in the group and the shares included knitted items, a latch-hooked wall hanging, baskets and fractal spun yarn. First there were LeClerc boat shuttles with bobbins and paper quills, mainly because my first loom was a LeClerc. More recently, along came a Bluster Bay traditional end-feed boat shuttle with hook-and-eye tensioner. Then came an Ahrehns & Violette (now Chico, Calif.-based AVL) end-feed tensioned shuttle along with the AVL 12-shaft dobby loom. 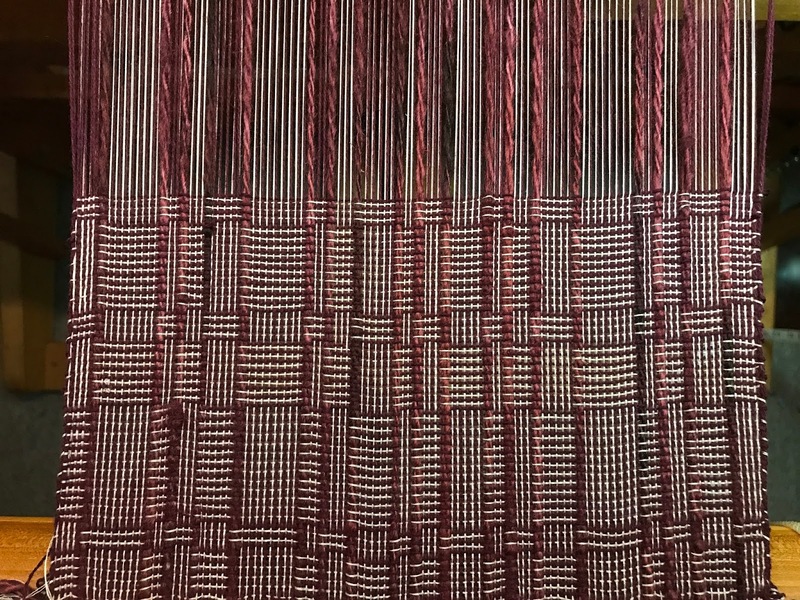 I was recently weaving cotton towels for a guild project on the new dobby loom. As I was evaluating the loom, I also began experimenting with the two end-feed shuttles. The 15" AVL, which was almost certainly made for the loom (They share the same inventory number from FIT), works beautifully, but feels too big and too heavy in my hand and for the 34' dobby loom. I was using two colors for some of the towels and that gave me a good opportunity to evaluate the shuttles against each other. Ideally, I'd want two shuttles of the same weight and balance for a project--and the end-feed shuttles I had were too different to pair. So, I tried using a traditional boat shuttle and bobbin with the Bluster Bay, only to be reminded how much I hated the rolling bobbins that either pay out excess weft or hold onto it so tightly it pulls the selvedge too often. A paper quill was better, but couldn't replicate the selvedges of the Bluster Bay. I longed for the 'just right' end-feed shuttle. I had purchased my first end-feed shuttle--the Bluster Bay--at a conference on recommendations from others, but hadn't really researched available products. I love the shuttle, but cost is always a consideration. Much as I love working with the elegant shuttle, the cost for shuttle with a metal tensioning device is one-third to one-half again the cost of other brands. I needed more information. I weighed my shuttles--with and without pirns--and collected specifications for end-feed shuttles with metal tensioning devices on the market. Then I consulted with weavers on Weavolution, where there had been a lengthy discussion a few years ago on the topic. After listening to what others had to say about their experiences, I balanced what I needed against cost. I bought a 12 inch Schacht end-feed shuttle. I have been using my new shuttle and I love it. It's not as beautiful in the hand, but i's a snap to thread (no hook needed!) and the metal tensioning pads are easily adjustable. No, I don't have a matched pair, but the Bluster Bay and the Schacht work pretty well together. At least for now. And now I have only myself to blame if my selvedges are less than nice. Here are some specs used in my decision-making process. Note: End-feed shuttles require pirns to match. A hat to celebrate scientists and independent, analytical thinking! The March for Science is scheduled for April 22. What to wear? We had pussyhats for the Women's March in January, but scientists need something a bit more...brainy? A little more 'smart' looking? The Brainy Beanie was a concept hatched in....my brain... and proven in the making! 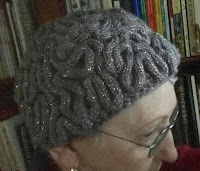 Using both knit and crochet techniques, the hat features a highly textured knitted brain-like design secured on a crocheted mesh-like skull cap. The open-work cap makes for lighter weight headgear that is also cooler and more appropriate for typical late April warmish weather. For the same weather-related reason, I chose an acrylic yarn, Caron Simply Soft Party, Platinum Sparkle, which has metallic strands. The glinting strands highlight scientists’ sparks of genius and creativity. The hat components are fast to make--and not difficult. 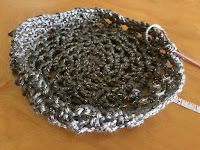 You only need to know the simplest of crochet stitches and how to sew with a needle and thread. And the knit part? If you use a spool knitter, you don't even need to know how to knit. Intimidated by yards of cord? Don't be deceived! It is quickly knit on a very inexpensive spool knitter, such as the Caron Embellish-Knit! Machine, which are readily available at Jo-Anne Fabrics (use a coupon! ), Amazon and Walmart--to name three sources. I bought mine for $15. Don't want to buy the spool knitter? You can hand or machine knit the iCord. Fair warning: Although the cap and the cord are quick to make, placing, pinning and securing the cords to the cap are where the time goes into making the hat. Some people have questioned why I made this in gray. 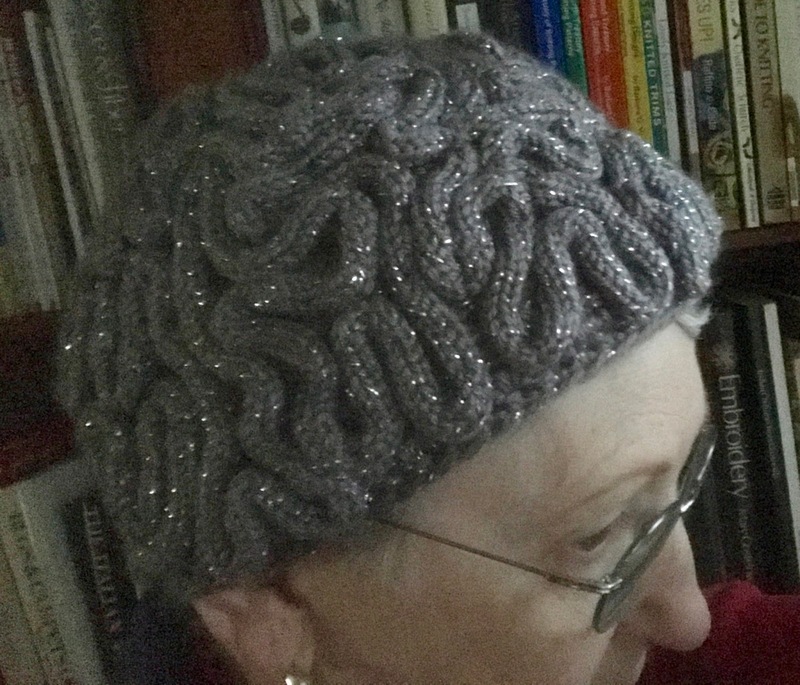 Well, for one, brains are commonly referred to as 'gray matter,' but the real reason this is gray is simple: I made this for a marcher who preferred the color gray. I'm looking forward to seeing one made up in pink, which by consensus seems to be the alternate choice. I had fun making this--and it's pretty cool to wear, too. 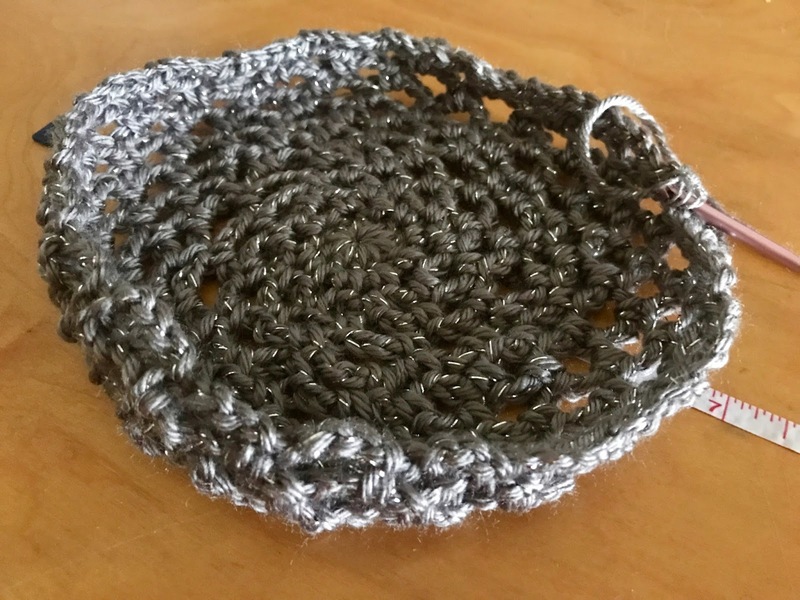 So I wrote up the pattern and posted it to Ravelry, where it is available for download. In the spirit of the March for Science, all proceeds from the sale of this pattern go to the The Sierra Club.